MANY older folk would have fond memories of the former Sentosa Cinema in Section 17, Petaling Jaya, a popular venue to catch a film and a meeting place for sweethearts for many years. After the post-World War II cinema burnt down in 1997, the site was used as a parking lot. Since October last year, the roughly two-acre freehold site has been fenced up, with hoardings stating that a mixed-use development is being constructed by the Conlay Group, under special purpose vehicle Kampung Manis Realty Sdn Bhd. 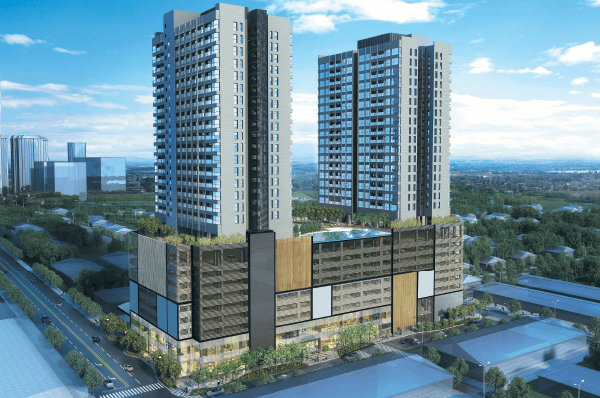 The maiden project under the group’s Biji brand comprises a residential component known as Biji Living, and a commercial component called Biji Shopping, and has a gross development value (GDV) of RM350 million. Conlay Group director Lim Lian Chee tells City & Country, “We chose to develop on this site as this is the last available parcel [for development] in the area.” The site comprises three commercial lots, one of which was acquired in 2004 and the other two in 2006. Lim says the area has not had any land for development for many years as it is a mature neighbourhood with a lot of landed properties such as terraced houses and bungalows. “It was by chance that we managed to purchase the first lot of this development parcel in 2004 from Shaw Brothers and subsequently, the last two lots from Petaling Garden Bhd in 2006,” Lim says. Adds Conlay Land Sdn Bhd senior property development manager Erwin Ho, “Over the years, I think Section 17 has been quite a vibrant place. Now, with the cinema no longer there, all that remains is the wet and dry market and the shops in the neighbourhood.” Conlay Land is a subsidiary of Conlay Group. The concept of Biji, which means “seed” in Malay, was inspired by the tiny and seemingly insignificant seed which, properly nurtured, has the potential to grow into a tree that can bear fruit and provide shelter for new life, giving vibrancy to its surrounding. The apartments will be housed in two 17-storey towers, atop a 10-storey podium with seven floors of parking space, two floors for retail shops and one floor for recreation and facilities. The project is anticipated to be launched later this month and to be completed by November 2017. The Biji development sits within a commercial square formed by four streets — Jalan 17/44, Jalan 17/27, Jalan 17/38 and Jalan 17/29 — and is surrounded by a mature neighbourhood comprising bungalows, semidees, terraced houses and shops. It is situated on the right side of the Kuala Lumpur-Petaling Jaya border and less than two kilometres away from three upcoming mass rapid transit stations at Bandar Utama, Taman Tun Dr Ismail and Section 16. The development is accessible via the Sprint Expressway, Lebuhraya Damansara-Puchong, New Klang Valley Expressway and Federal Highway. 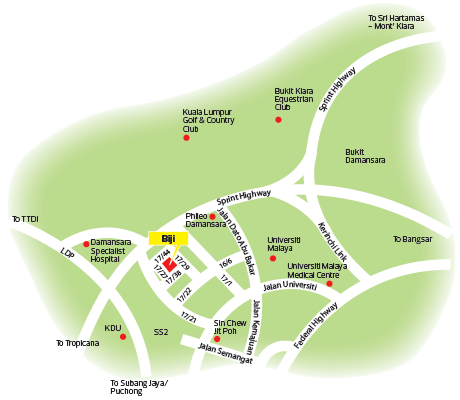 Among the amenities in the vicinity are educational institutions such as Universiti Malaya, Universiti Islam Antarabangsa, Universiti Tuanku Abdul Rahman, KDU College and TOC Automotive College, and hospitals such as University Malaya Medical Centre, Columbia Hospital and Damansara Specialist Hospital. The residential component comprises 425 freehold serviced apartments offering four layouts, with built-ups of 550 sq ft for the studio unit and 789 sq ft for the 1-bedroom unit. The 3-bedroom units have built-ups of 1,024 sq ft and 1,095 sq ft.
“One tower has 136 units of 3-bedroom apartments while the other consists of 289 units of studio and 1-bedroom apartments. The 3-bedroom apartments cater for the young urban family and we have received a lot of interest in these units, mainly from the community within Section 17,” Ho says. “When we started the planning process for this development, our market studies revealed that there were many residents within Section 17 looking to buy apartments for the second generation, such as their children, within the area itself,” he adds. The studio and 1-bedroom units, he says, are popular with young executives who do not have much time to maintain their homes because of their busy lifestyles and frequent travels. “The studio apartments are also targeted at investors interested in renting the units out to students as there are quite a number of universities and colleges around the area,” Lim explains. “Many retirees and those in the older generation mentioned to us, during our market study, that they are quite interested in moving into a smaller unit such as an apartment, where a lot of the maintenance is taken care of. This group has lived in Section 17 most of their lives and are very comfortable with the area, so if they are considering moving into an apartment they would prefer to move into one within the neighbourhood,” he says. About 600 parking bays will be allocated for residents on levels six, seven, eight and nine. The 3-bedroom unit comes with two parking bays while the studio and 1-bedroom units get one each. The building is oriented to maximise natural lighting and ventilation. Each apartment features a balcony with a glass railing for a clearer view, and comes fitted with solid timber doors with chengal frames, merbau timber flooring and rain shower for the bathrooms. In addition, the units will have wardrobes in the master bedroom, air conditioning in the rooms and living area, and kitchen cabinets with hob and hood. Resident-only facilities include a 33m lap pool, gymnasium, children’s playground and function hall on level 10. For security, there will be 24-hour CCTV surveillance and private access cards for lifts. The apartments are priced from RM428,906 to RM948,137, and the indicative maintenance fee is 25 sen psf. The price works out to RM700 to RM900 psf, which is 5% to 10% lower than the market prices of developments in the vicinity, Ho notes. Lim says about 200 apartments have been booked, and he believes it is a good time to launch the project. “We did consider that there was a lot of uncertainty due to the Goods and Services Tax (GST). However, now that GST has been implemented, we feel that people are more at ease and would be interested in buying property,” he says. The commercial component, on levels one and two, is conceptualised as a neighbourhood mall. Retail outlets will include international grocers, a pharmacy, family restaurants, bistros, cafés and sundry shops. “The mall will be owned and managed by the company and we are looking at quite a large number of F&B outlets and neighbourhood shops. The anchor tenant will be a grocer and we are still in negotiations with a few potential tenants. The grocer will also sell speciality items, such as imported foodstuff,” Ho says. The details of the tenants have yet to be confirmed. The mall will have over 80,000 sq ft of net lettable area, 30,000 sq ft of which will be allocated for the grocer. “As it will be more F&B oriented, we have allocated about 60% of the retail space for F&B outlets. We have also engaged retail consultants for the design of this mall, although developers would not normally engage consultants for a mall of this size,” Lim says. There will be separate entrances to the parking lots for Biji Living residents and the public. Parking bays for non-residents will be on levels three, four, five and at the basement, which will have a high ceiling to cater for trucks and lorries so that goods can be unloaded without causing traffic congestion on the surrounding streets. A total of over 450 parking bays will be available at the podium levels for non-residents. Meanwhile, the Conlay Group, with the assistance of the Petaling Jaya City Council (MBPJ), will be building a new marketplace on the west side of the Biji development to house the four-decade-old Section 17 market. The traders — 128 in the morning and 27 in the evening — had been operating their businesses on Jalan 17/27 for many years, and were promised a new market with a modern refuse system, triple volume ceiling height for ventilation, covered drainage, anti-slip flooring and properly sectioned stalls across aisles. “The new market will be a modern market with proper ventilation, proper sanitation such as grease traps and sewerage system for waste water, epoxy-coated flooring, and public toilets. We will be making the new market with no columns and there will be a partition between the halal and non-halal sections,” Lim says. “Our idea is to drive and manage the wet market as we feel that it is a plus point for our development. It has been running for over 40 years and people have got to know Section 17 for the market. Hence, we have placed importance on upgrading it to complement our development,” he adds. The traders have been temporarily relocated to Jalan 17/29, as directed by MBPJ, until the new market is completed in November 2016. “After the market is completed, the traders will move from the temporary site to the new market,” Lim says. Licence fees and utilities will be paid to MBPJ. To make space for additional parking bays, Conlay will change the current parallel orientation to diagonal parking. With the traders operating almost 12 hours daily next to the two-acre site, it is very challenging to construct on such a small parcel, says Lim. To ensure safety and minimise risks, a specific construction methodology had to be adopted. “We have to be very, very careful. From the inception of the project, we have been very particular about safety issues. As we are contractors ourselves, we have looked into what construction methodology to adopt. For instance, the construction of the basement level cost us more as we use the bore piling method that does not cause earth movement compared with, for instance, the sheet piling method,” he explains. In addition, “to reduce risks to the surrounding market and shops, we ensure there is a safety screen to cover the top portion for construction works at the upper levels”, he adds. Flat slabs are used for the podium car park levels and aluminium formwork system for the tower blocks to make construction simpler, he explains. The multi-storey Biji development is likely to attract more traffic to the neighbourhood. To ease congestion and improve traffic circulation, the developer, together with MBPJ, has drawn up plans to widen the roads, introduce one-way traffic flow along Jalan 17/29 and Jalan 17/27, and install traffic lights at the intersections of Jalan 17/29 and Jalan 17/22, and Jalan 17/21 and Jalan 17/38. The developer will be focusing on Biji at Section 17 this year as well as Manjung City Square (MC2) in Perak. MC2 is a mixed-use development with a GDV of RM1.2 billion, comprising 270 shops, a street mall, hotel, private college and 1,500 apartment suites. A joint venture with a private company, which Conlay declined to reveal, the project is expected to be launched within 4Q2015. Also lined up for launch in 4Q2015 is the company’s headquarters at [email protected] in Subang Jaya. The office tower comprises 66 office units, eight retail shops, and has a GDV of RM80 milion. For 2016, the developer will be looking to launch subsequent Biji developments in Subang Jaya and Petaling Jaya. Biji Junction at Jalan Universiti in Petaling Jaya, set to be launched in 2Q2016, will have a GDV of RM200 million and offer 300 serviced apartments on a one-acre site. 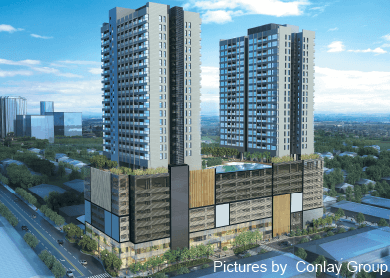 In Subang Jaya, Conlay is planning a joint venture with AmanahRaya Development Sdn Bhd, comprising three blocks of 544 serviced apartments on a three-acre parcel. Expected to be launched in 4Q2016, it will have a GDV of RM350 million. Meanwhile, the developer is also setting foot in Sabah, and expects to launch its first project there, Hilton Hillpark in Penampang, Kota Kinabalu, in 2Q2016. Comprising 520 serviced apartments, it will have a GDV of RM320 million. While Lim agrees that the property market has softened, he believes that demand is still strong. To secure land in strategic locations, he says the group does not mind paying a premium as it feels it will be worthwhile in the end. “In terms of GST, we are not greatly affected because the turnover for our construction is quite huge at RM2 billion to RM3 billion each year, and we enjoy good business relationships with our suppliers,” he says. Since its establishment in 1998, the Conlay Group has accumulated over 100 acres of undeveloped landbank in Klang Valley and Sabah, including joint-venture projects such as the one in Perak. Moving forward, the group will focus on developing its existing landbank, which will keep it busy for the next three to five years.